In July 1973, George Mason University was about to undergo another major change. It had only become independent a year earlier. In its relatively brief history of just sixteen years, Mason had three different chief administrators, two of whom were sent from Charlottesville to operate the college. After an extensive search, the Board of Visitors appointed an outsider, Dr. Vergil Homer Dykstra, as the first administrator actually hired as President of George Mason University. George Mason’s new leader hailed from Binghamton, New York, where he was Vice President of the State University of New York’s campus there. This narrative is based on a 2009 oral history interview with Dr. Dykstra. While George Mason University had come a long way from its beginnings as a small Northern Virginia branch of the University, there were those among the faculty and its student body who felt that there were a few fronts on which progress still needed to be made at the very young institution, according to Dr. Dykstra. Some members of Mason’s faculty and student groups had a strong distrust of its previous administration. 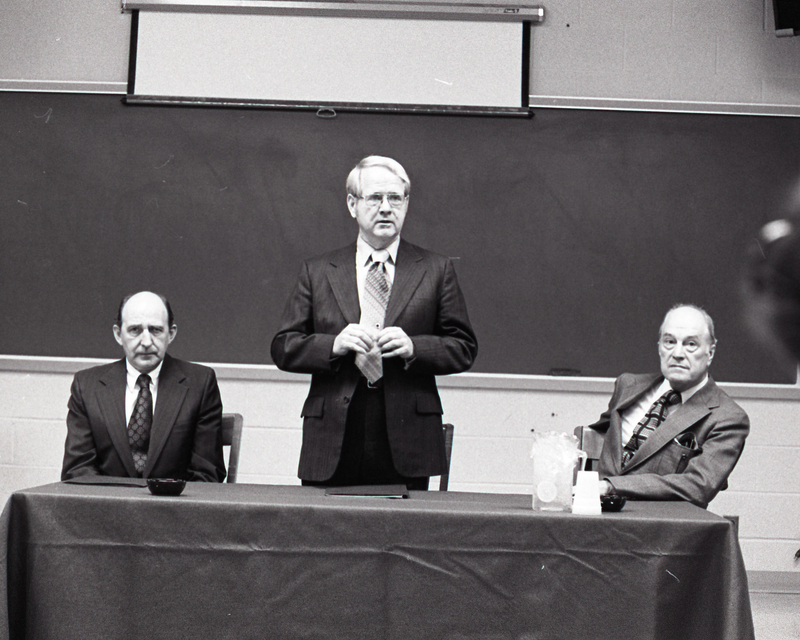 Though Chancellor, and later President, Thompson had expertly helped George Mason grow and become an independent university, there were some who thought his administration did not share their opinion on issues of free-speech and academic freedom. The new university was also still having difficulty implementing equal opportunity standards in recruitment of students and faculty. Dr. Dykstra would meet these issues head-on as President. Dykstra, was born in South Dakota and raised in Iowa. He received his undergraduate degree from Hope College in Michigan, before receiving his doctorate in philosophy with a minor in English from the University of Wisconsin. His first experience in higher education leadership came when he received a fellowship to study college administration at the University of Michigan Higher Learning Center. He took a job teaching at the University of Cincinnati before moving to Harpur College, where he not only taught, but became a part of the school’s administration as Vice-President. Dykstra oversaw the transition of Harpur College into Binghamton University, one of today’s highest-regarded public universities in New York State. Dykstra was Vice President of Administration for Binghamton University when a friend invited him to apply for the position of President at George Mason University. Dr. Dykstra had never heard of George Mason University, and only applied because of the university’s proximity to Washington, D.C. He was invited to interview with the Board of Visitors in the spring of 1973 and was later offered the position as President. Dykstra would later remark that he was very excited about this opportunity because he had previous experience with ushering in a new university, and wanted to lead another school in its early years. He officially assumed the role of President of George Mason University in July of 1973 in an impromptu ceremony in which President Emeritus Lorin Thompson transferred to him the keys to the President’s Office. Dykstra himself wasn’t very certain of his standing with the faculty with some of the faculty at the beginning of his tenure. He later commented that he initially suspected that some at George Mason might have thought of him as “a Yankee coming to Virginia.” Perhaps he would not fit into the southern culture he assumed was a strong part of university’s heritage. Over the course of his career at George Mason, Dykstra would work to bridge the apparent gap between the faculty and administration by striving to earn their respect. Dr. Dykstra would later say that opening the line of communication between faculty and administrators was an important first step in bringing the two groups together. Dr. Dykstra sought to foster a closer sense of community at George Mason University. When he arrived, according to Dykstra, the university operated under a system where “students were only there to learn, teachers were only there to teach, and administrators were only there to run the school.” Dykstra believed that the university needed to become more of a family environment. He was particularly supportive of any efforts to diversify the school’s student body and staff. Dykstra was a strong advocate of minority recruitment. The Civil Rights Act, passed almost a decade earlier, was designed to remove barriers to education for minority students, but the Commonwealth of Virginia had only seriously begun the process of desegregation in the late 1960s. Some in Richmond and other areas in Virginia still wished to slow the process of integration of minorities into its public schools. Dykstra, who came from a northern environment supportive of racial integration, was taken aback by what he described as a “southern, plantation style mentality” exhibited by officials in the Virginia government and at other universities in the Commonwealth. Over the course of his career at Mason, Dr. Dykstra would have little patience for staff members who attempted to sabotage his efforts to enact affirmative action program at Mason. During his first few months on the job, Dykstra established the first Office of Minority Recruitment and hired the first staff members charged with bringing minority applicants to Mason. Dr. Dykstra oversaw the construction of some of the most prominent landmarks on campus today. The University Union (now known as Student Union Building I) and the A-Wing tower of Fenwick Library were completed during Dykstra’s term as president. Construction of student residential housing also began during Dykstra’s presidency, although he was not an early supporter of on-campus housing, believing that Mason should focus on being a university for Northern Virginia commuter students. However, the administration eventually bowed to pressure from students, and the Student Apartments became the first student housing on campus in August of 1977. While not established during his presidency, extensive plans for George Mason’s future School of Law were drawn up during Dykstra’s tenure at the university. However, as with on-campus housing, Dykstra was not a fervent supporter of the law school. He agreed with other Virginia officials who believed that state funds should be used to improve existing law schools instead of opening new ones. The George Mason University School of Law would eventually open in 1979, just two years after Dykstra’s tenure at Mason. Citing fatigue, President Dykstra unexpectedly resigned in April 1977 after four years of service at George Mason. Dr. Dykstra was followed by Robert Krug, Mason’s Vice President for Academic Affairs, who would serve for one year as acting President. Dykstra would later become a vice-president at Montgomery College in Maryland. Dr. Dykstra passed away in December of 2010 at his home in Fairfax. Browse items pertaining to George Mason University President Vergil H. Dykstra.